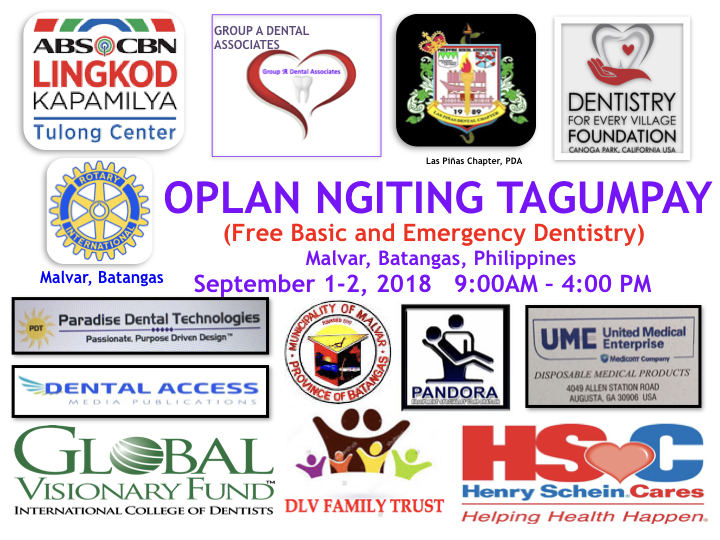 The much-awaited third humanitarian mission of Dentistry For Every Village Foundation for the year 2018 set at the Municipality of Malvar in the province of Batangas, Philippines is finally all set for September 1-2, 2018. 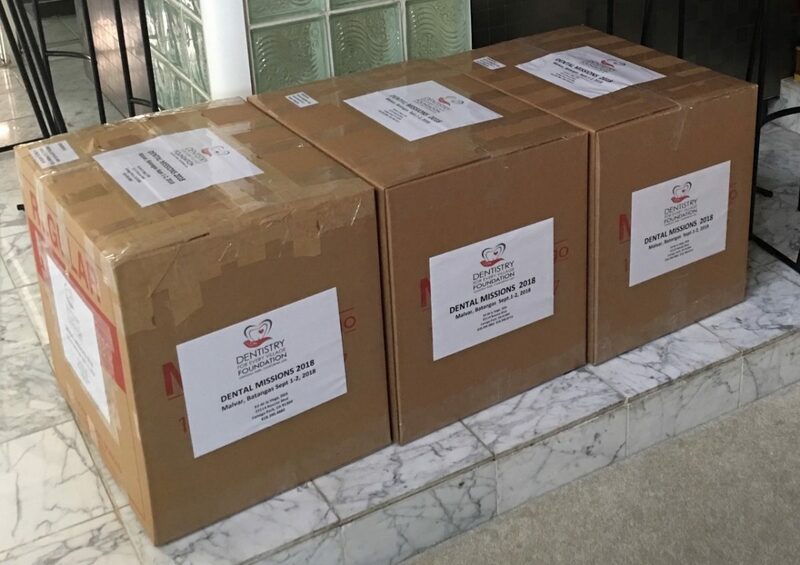 From the central office at Canoga Park, CA., all the donated items including dental supplies and small instruments notably from the International College of Dentists Global Visionary Fund and the Henry Schein Cares Foundation are all packed in three 50 lbs.“balikbayan” boxes, the traditional boxes used by Filipinos that travel home to visit. They will be the “checked-in” luggage of Dr. Ed de la Vega who will travel to the Philippines to spearhead the mission. Included in the boxes are three giant 18 L steam driven sterilizers and two portable micromotor electric engines with handpieces designated for the oral surgery and the Sealant and Fluoride Application sections respectively. The presence of the new equipment will exponentially improve the delivery of service for the poor and underserved. The three sterilizers will speed up the turn around time of instruments being sterilized while the micromotors will free up the portable dental units previously shared by the Sealant and the Restorative sections. Now the Sealant Section will have its own designated units and need not share with the Restorative Section anymore. Also in the boxes is a digital x-ray sensor complete with software to complement the only x-ray sensor of the Foundation. Dr. Randy Lozada of Valencia, CA donated the sensor. A brand new high power light-curing unit donated by Dr. Kathrine Grace Ogtong of Winnetka, CA is also included in one of the boxes. From the Philippine end, the ocular inspection by the Foundation’s partners, the ABS-CBN Lingkod Kapamilya Tulong Center personnel have been completed. The division of labor and tasks between them and the hosts, the Rotary Club of Malvar has been discussed in detail and agreed upon. The forward people from the Foundation also completed their final ocular inspection as well and have submitted a report to the central office detailing what needs to be provided to make the mission go smoothly. The volunteers had been informed accordingly and everyone is now familiar with what they are supposed to do and which section they will be assigned. All the logistics have been completed including transportation and pick up points. Small details such as color and sizes of scrub suits, pants, and shoes to wear have been completed as well. Barring another huge typhoon that may cause another flooding, the mission is a go. 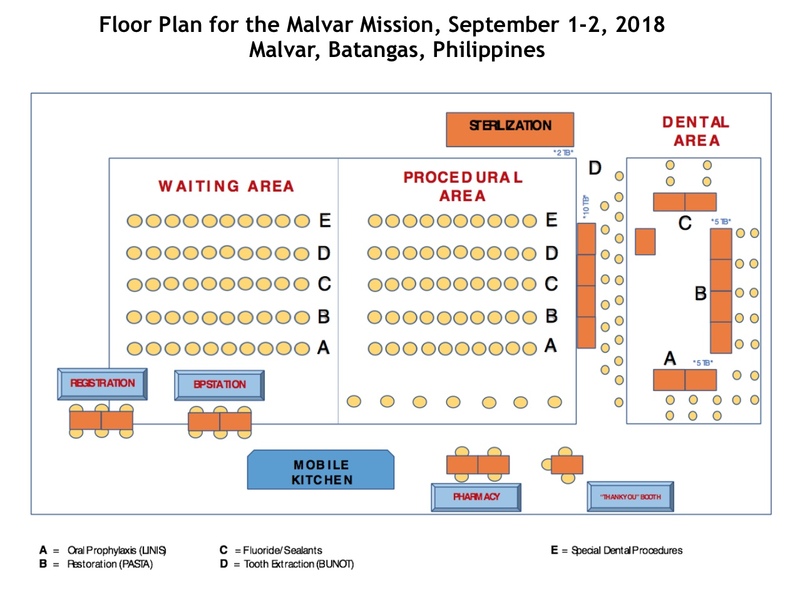 But even at that, if rains come during the mission the work will not be interrupted as the site of the mission is a covered basketball court courtesy of the Municipal government of Malvar.